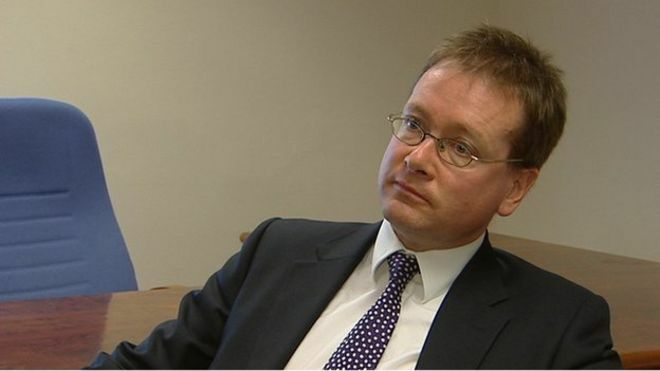 Northern Ireland’s Attorney General has accused Bank of Scotland of “criminal fraud”. John Larkin QC made the comments in relation to the bank’s treatment of some customers who fell behind on their mortgages. An earlier court hearing ruled the bank unfairly double-billed some customers whose mortgages were in arrears. Bank of Scotland rejected Mr Larkin’s claims, saying it strongly takes issue with the allegations. The bank had appealed the verdict of the earlier court hearing but dropped that appeal on Monday morning. Mr Larkin was in court for the hearing and said the original, scathing judgement was “unduly tender” on the bank. He told the court that there was evidence of “criminal fraud under the 2006 Act” and that the matter has now been drawn to the attention of the police. Mr Larkin acknowledged that it was extraordinary for him to intervene in matters of “private law” between a bank and its customers. A barrister for the bank, Stephen Shaw QC, said Mr Larkin’s view of the matter was “based on a misapprehension”. The original case focused on the way the bank added arrears to the initial mortgage borrowing. That is a standard practice for tackling arrears and is known as capitalisation. It has the effect of increasing borrowers’ monthly repayments. The judge ruled that once capitalisation had taken place, the mortgage should no longer be considered as in arrears. However, the bank continued to treat such mortgages as in arrears and used that as the basis for bringing legal cases. The judge said this meant borrowers had been held in fear and were being threatened with repossession on account of an “erroneous and fictional arrears balance”. The bank is a major mortgage lender in Northern Ireland under the Halifax brand, and is ultimately owned by the Lloyds Banking Group. In a statement issued after the court hearing, a spokesperson for Lloyds Banking Group said: “There have been no allegations of fraud in these cases. In relation to the earlier court verdict, the spokesperson said: “We no longer believe that an appeal is necessary in this case and as such have withdrawn from the appeal process. We would reiterate that repossession is always a last resort.